Fast track your ability to create nameplate and label designs. It is easy to overlook some of these steps and end up spending time redesigning your nameplate. 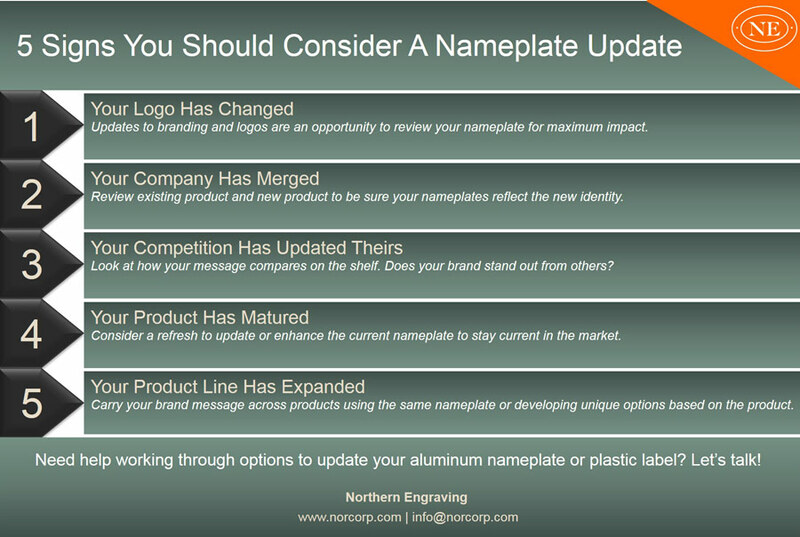 This is a quick checklist of things to consider when working on a new nameplate. Nameplates aren't always the first thing on a Designer's mind. Waiting until the last minute can lead to cutting corners and compromising. Review options for aluminum and plastic nameplates. Colors, adhesive and testing requirements are important building blocks for any product identification. Summary of information needed when supplying direction for colors on aluminum nameplates. Vector vs. bitmap graphic review for preferred file formats to produce aluminum and plastic nameplates and trim. Aluminum stock dies are cost effective and provide time savings for new nameplate launches. Application and environment are considerations in choosing the correct adhesive for your nameplate or badge. Common nameplate and label specifications for details like conflict materials, temperature and adhesive requirements. 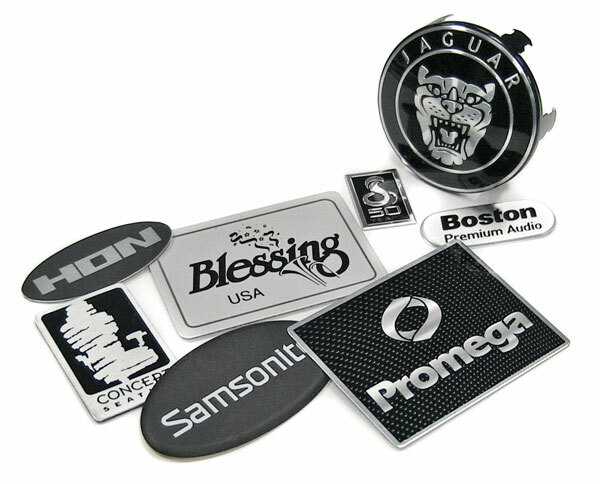 Metal and plastic substrates are offered as base materials for nameplates, emblems and labels. We make nameplate design simple for everyone. Review shape options for aluminum nameplates and plastic labels. Emboss options and guidelines for metal nameplates and badges. Create movement with brushing, spin, and engine stripe. Review four ways to hide the raw silver edge of an aluminum nameplate. Several options for silver graphics for your aluminum nameplate. Cost effective options to create dimension without added tooling operations. Need help sorting through options for your nameplate or trim project? We can help! Find answers to frequently asked nameplate questions. Call us and speak with a nameplate specialist about your specific needs. Choose from hundreds of finishes to enhance nameplates, labels, appliques, overlays and so much more. Black texture is a popular choice as decoration for aluminum nameplates. Examples compiled into a short video. Examples of polycarbonate and chrome polyester labels with a brushed metal look. The matte surface effect of a sandblast finish is translated onto aluminum for use in nameplates, panels and graphic overlays. Aluminum nameplates are often used on large and small appliances to created the stainless steel look for the product. The richness of anodized metal can be achieved with traditional printing processes for aluminum nameplates. Micro finishes, warm copper tints and black linear structures are among the most requested finishes for nameplates and decorative trim. Customize your metal nameplate or trim using patterns for background finishes, accents or to differentiate within your product line. Aluminum is friendly for decoration to take on the appearance of other metals like brass, stainless steel and tungsten. Top 10 patterns pulled into a downloadable eBook for reference.